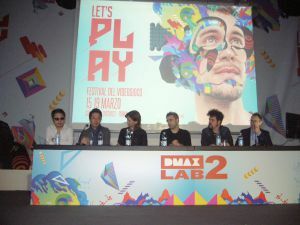 It was 31.000 the amount of attendees to confirm the great success of Let’s Play’s first edition, Italy’s Video Game Festival, which has been held at the Guido Reni District in Rome from March 15th to 19th. Exhibitions of new video games, consoles and computers to play over 50 different games with; labs, workshops and seminars have livened up the numerous stands and entertained youngsters, families and the several fans who took part in the event, which has been planned with the help of AESVI – Associazione Editori Sviluppatori Videogiochi Italiani (Italian Video Games Developers Editors Association). Among the several activities there were the “Let’s talk”, in-depth study panels by AIV – Accademia Italiana Videogiochi (Video Games Italian Academy), about the multiple professional figures that you can find in the game development world. And just in one of these panels Shine Soundtracks got involved to represent the game-audio in Italy side by side with other important experts of the sector. “Music in video games. From the great blockbusters to the independent productions” has been the title of the seminar that was focused on the importance of music and sound effects in video games. 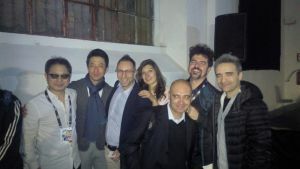 The event, hosted by Il Manifesto’s journalist Federico Ercole, had, among its speakers, the famous Japanese Takeshi Furukawa and Tomonobu Kikuchi, respectively the Composer and Music Producer for The Last Guardian’s soundtrack, the popular adventure video game developed by Team Ico and SCE Japan Studio, published by Sony Computer Entertainment on Playstation 4. So, it was The Last Guardian to win the Drago d’Oro award for The Best Soundtrack of the year (which took place inside the Let’s Play) indeed. On the stage, together with the Japanese professionals, there was our CEO Giovanni Dall’Ò, invited to represent Italian composers. The meeting aimed to deep examine the role of music and audio in video games and how they influence the gaming experience. Also, more technical topics have been covered, that is how a soundtrack gets born, what the relationship between music and sound design in a video game is, and what’s behind a compositional catharsis. But there was also interest about minor curiosities, like the one forwarded to the composer Dall’Ò: “why the name Shine?”. This question allowed Giovanni Dall’Ò to tell that behind our business name there’s the “shininess” concept indeed, represented by the intuition, by the eureka moment, by the artistic inspiration that, in his case, actually supports the composing idea. Plus, Dall’Ò highlighted the role of music as an element able to join rational and irrational aspects, during both the composing phase and the listening experience. On the stage, there were also Giovanni Ricciardi from WANTmusik and Davide Pensato from dpstudios, who shared with the audience their experience as audio designers and entrepreneurs in this field. 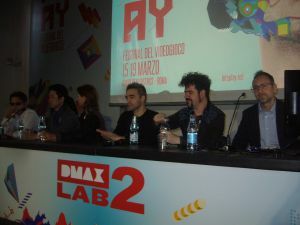 Giovanni Dall’Ò also illustrated what is the role of a soundtrack composer in a video game’s production process, starting from his own experience in developing several games, such as World of Pirates by Zpx, and especially the action game Zheros by Rimlight Studios, whose trailer has been showed and that will be available on the Chinese market soon. And finally, it was such a great occasion to share the satisfaction for the win of the VIDEO GAME MUSIC PART III award sponsored by the New Yorker Playcrafting and Indaba Music (respectively a video game development community and an entertainment technology company), and to present to both fans and people who work in this sector, the new royalty free music library with exclusive contents by Shine. It was, without any doubt, a fruitful and enriching experience for the Shine Soundtracks representatives, Giovanni Dall’Ò and Vera Sorrentino who, during the following days, have also had the opportunity to meet other experts of the sector to share their own experience in the video games soundtrack and sound design development with.